A life in a webbis: Food : Honey Creme Ice Cream! Ice cream has always been classified as a not good kind of food. It is usually sweet and has no better ingredients in it. Introducing the fun and healthy organic premium soft-serve ice cream by Honey Creme. It is the famous selling ice cream from Korea-Taiwan joint venture. As South Korea being famous with its Comb Honey Soft Serve Ice Cream hence, the name Honey Creme was born! 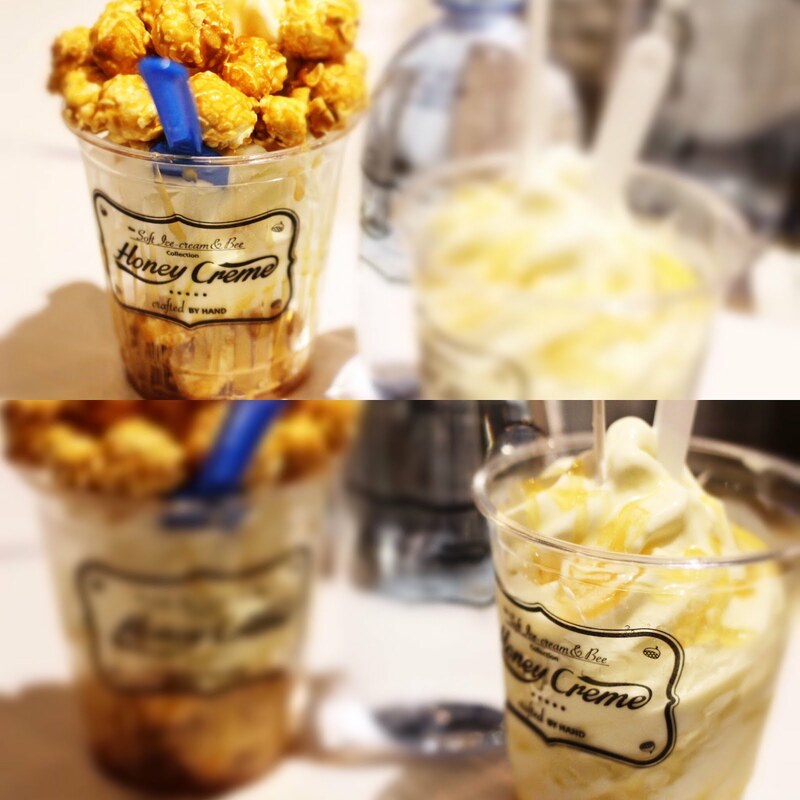 Honey Creme's signature ice creams which are the "Comb Honey Soft Serve Ice Cream" and "Pop Corn Soft Serve Ice Cream" has been widely consumed since their first opening in March 2014 at Taipei City well known "Ice Cream War Zone", Taipei Zhongxiao East Road. Now, they have opened a shop in Malaysia itself and their second shop in Malaysia is located at Sri Hartamas and I attended their grand opening last Saturday. Their Hartamas branch is located right beside Mei by Fat Spoon, at the Jalan 27/70A. Very easy to find as they have that little rounded signboard on the side of the shop. The decoration of the shop is super Christmas-y as well. It's very cosy and i love how they decorated the shop. It makes me want to sit inside the shop and eat ice cream, slowly and peacefully. They have several menu for their ice cream. The price starts at around RM9.50 for the original flavor and can go up to RM14.50 for some premium toppings! All their ice cream base are the same. It's the Vanilla soft served ice cream. The flavors would be the toppings that you can choose from popcorn to tiramisu to honey comb and many more! I personally choose the Pop Corn soft served ice cream while boyfriend chooses the Comb Honey ice cream. If you are a huge fan of natural sweet / honey sweet you should definitely try out the Comb Honey topping. It is super sweet! My Pop Corn ice cream are sweet too as the pop corn is a caramel pop corn. The event was well organised and it was jam packed with people who loves ice cream! Each attendees will get a free taste of ice cream which is super awesome!